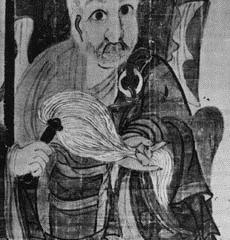 ZEN MASTER HAKUIN.This self-portrait, painted in 1768, shortly before Hakuin’s death at eighty-three, shows the master in ceremonial robes and carrying a hossu. ABBOT AMAKUKI delivered these lectures over the Kyoto Radio early in the 1930’s, and soon afterwards revised them for publication. There are certain peculiarities of style for which the reader should be prepared. 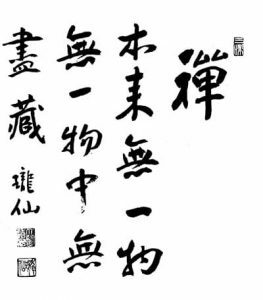 To illustrate the Zen principle that sacred and everyday are not distinct, he sets the sonorous Chinese monosyllables of the sutras against light Japanese colloquialisms; compassion and irony, sublimity and familiarity, are deliberately juxtaposed. He has a special technique of repetition of a key phrase in different contexts; this is a hint for working on the koan. Another well-known feature of Zen style is to punctuate a narrative with short comments, sometimes no more than ejaculations, to point the incidents of the story. He destroys innumerable accumulated sins. How should there be wrong paths for him? The Pure Land paradise is not far. Readers will notice the fondness for a concrete illustration rather than a universal principle, and for action rather than abstraction; these are characteristic of Japanese Zen, particularly in its expression as poetry. IN THE original the Song of Meditation is in very easy language. Before Hakuin (1685-1768), Zen in Japan had not quite given up its Chinese flavour, but with him it became completely Japanese. Previously too it had a somewhat aristocratic outlook, but he popularized it and made it universal. If Muso Kokushi (1275-13 51) of Tenryuji temple, the teacher of emperors, represents aristocratic Zen, we may see Hakuin as the representative of the people’s Zen. His Zen is austere and yet universal, like towering Mount Fuji, to which everyone can look up from wherever he is. Hakuin’s Zen is an eternal luminary in the spiritual firmament and a supreme contribution to Japanese culture. Though the Song is so easy to follow, yet it contains Hakuin’s profoundest and most mystical doctrine. Of course, as to attaining his First Principle, which speech and thought cannot reach, each man has to realize that for himself. If words or thought could grasp it, then it would be already only a second or third principle. In these lectures the Song will be explained as far as possible in a simple and popular way which can be understood by anyone who cares to read. “All beings are from the very beginning Buddhas” “All beings” is the classical Buddhist phrase, but we can take it as referring principally to us human beings. This one phrase, “all beings are from the very beginning Buddhas,” is the centre and beginning and end of the whole Song. We in this world of illusion, and the Buddhas in the world of realization are from the very beginning one and not two. Illusion and realization are not two! The oneness of Buddhas and all beings is here proclaimed outright. If we can grasp this phrase completely, the rest of the Song will be easy. It is the centre and beginning and end not only of the Song of Meditation, but the forty-nine years* preaching of Shakyamuni Buddha was in essence the same truth, and the 84,000 gates of the Law are none other than this. All beings are from the very beginning Buddhas. Buddha means an awakened man, an enlightened man. The word carries the meaning of deliverance from all bonds and fetters and ties. He awakes himself, then awakens others; that is to say, he is perfect both in realization and in spiritual action. He has realization, action, and perfection. The Buddha has three bodies: first the body of truth such as Vairo- chana Buddha, the Buddha of Truth, whose form is all- pervading. His tongue the stream in the valley, his pure body the colours of the mountain—the wind and the light, the hills, rivers, grass, and trees, all are this truth-body of the Buddha. The second is the body of bliss; by virtue of his holy practices the ideal Buddha like Amitabha appears in an ideal form. The third is the body of physical manifestation, which is the Buddha who appears as a man, the so-called historical Buddha, a Buddha like Shakyamuni, who appeared in India. These three bodies, the truth-body, bliss-body, and manifesting body, express the three aspects of the Buddha—essence, form, and action. But this Buddha and ourselves are not separate. All beings are from the very beginning Buddhas. It is the same truth as in the famous phrases that the passions are the bodhi, that Sansara or birth-and-death is Nirvana. Being in the world of illusion is called “living being,” and being in the world of realization is called “Buddha. ** When deluded, a living being; when enlightened, a Buddha. The Buddhas are the living beings, ignorance is enlightenment, enlightenment is ignorance, the Buddhas and living beings are the same. It is related in the Avatansaka Sutra that after six years of intense practice, on the eighth day of the twelfth month under the bodhi tree, Shakyamuni saw the morning star and suddenly had the great realization (satori). His first utterance was: “Wonder, wonder! All living beings are endowed with the Buddha wisdom and virtue!” Another account says it was in these words: “When a Buddha attains and sees the truth-world, grasses, trees, earth—all, all become Buddhas!’* In other words the Buddha nature is ever perfect in each and every one of us. The Prajna- paramita Hridaya Sutra says that form is the void and the void is form. The relationship between the Buddhas and living beings is exactly like that. The Sutra does not say that the world of forms, the material things, is annihilated and then the void is attained, or that out of the void, as reality, the world of forms is manifested. The world of forms as it is now is the void, and similarly the void without changing manifests the form-world of mountains, rivers, and earth. “Form itself is the Void; the Void itself is form.” This is in the stiff style of calligraphy knowr as kaisho. Yet the waves arise from the water. The Buddha is the deliverer, just because of the sorrows of the world. If there are no more sorrows, then from what is he deliverer? The word “ice” is significant. Water, when exposed to cold, freezes, hardens, and becomes ice, and though its nature does not change, it loses complete freedom of movement. So through illusion of ignorance, the human being sets and hardens, and though his Buddha-nature does not change, he is debarred from the limitless freedom of the Buddha. But just as the ice, set and hardened by the cold, is still in fact all water, so the human being, set and hardened by illusion, is still in fact all Buddha. There is a difficulty. If we say ice and water are the same thing, after all they aren’t, are they? If we went to buy ice we should not accept water. It is not a relation of identity. Yet we cannot say that they are not the same thing, because apart from water there is no ice. So it is not a relation of difference either. Ice and water are not identical and not different. The relation between Buddha and ourselves is just like that. If it is said we are the same thing—well, we are not. We are not the same thing. But if it is said we are separate, we are not. We are not different. So we are neither the same nor different. To apply heat and melt ice is a roundabout way of knowing it is water, but when we realize that the ice just as it stands is water, we can appreciate the water in the ice. Living beings as they stand are Buddhas, and when we realize it we can appreciate the Buddha-essence in the living beings. Since the ice is frozen hard, it cannot adapt itself to the shape of a vessel as water can. The human being, set and hardened by illusion, has not the spiritual power to act in unlimited freedom. When the ice is melted, the water regains its freedom, and so by dissolving the illusion we can acquire freedom and use it spiritually. The difference is just whether the ice is melted or not. When the human body is rigid, it is of little use. It is not healthy. In Zen it is a question of rigidity not of body but of mind. The difference between Buddha and ordinary man is not form, but whether or not there is the rigidity of mind. (With ice and water the difference is not of content but of outer form, and the analogy cannot be pushed too far.) If by one revolution of the mind we can get rid of its rigidity, then we are perfect Buddhas as we stand. It is the rigidity of mind which is the cause of all the trouble. The truth is not the special preserve of Hakuin. The Lotus Sutra says clearly: “O disciple, the Buddha’s wisdom and virtue are present everywhere. And why? Because there is no living being which is not endowed with them. But clinging to confused and contrary notions, they do not realize it. When they leave their wrong thinking, universal natural and infinite wisdom will manifest in them. The Buddha, perfect in the fourfold wisdom, pities us that we do not know the Buddha within us.” In the Nirvana Sutra it is written, “All, all have the Buddha nature, but it cannot be seen when covered by the passions.” In the Sutra of the Sixth Patriarch: “The worldly man from the beginning is naturally endowed with the wisdom of prajna, but because he is deluded he cannot realize it for himself.” The Buddha seed is everywhere, the Buddha nature is possessed by all, just as wherever you dig the earth you will come to water. It is the mind that makes the meanness of the body. Digging or not digging, planting or not planting, that is the point. We must get rid of delusions and leave our attachment, to see things anew from an awakened standpoint. The Buddha is awake, and an awakened man is enlightened. He has not really acquired anything new, but has woken from the illusion and veiling of ignorance. It is putting off the coloured spectacles. While wearing the coloured glasses of egoity and partiality, whatever colour we see, red or blue, it is never the true colour. While bound in the dream of confused and contrary thinking, existence and non-existence both are no more than figments of a dream. An ancient says of this: “While in the state of illusion, the four affirmations are each wrong; in the state of realization each of them is correct,” and he gives the illustration of a fragrant blossom on a tree in the garden. In the state of illusion we see it and say that it exists. And yet, it does not, for before it appeared on the branch, and again three days from now, where is it? But it would be wrong to say it does not exist—is it not a fact, with its sweet smell, right before us? Though it may fall, yet the fruit will appear, and then next year will it not come again, tempted into bloom by the spring breeze? Again it would be wrong to say that it neither is nor is not, and wrong also to say that it both is and is not. It is, it is not, it neither is nor is not, it both is and is not—all the four affirmations are wrong. But once looked at from the standpoint of satori, it is right to explain that it is, right to teach that it is not, right again that it neither is nor is not, and there is no bar to saying it both is and is not. All four statements are right. When there is real mother love, it is right when she pets the child, and right again when she scolds it, and right when she neither pets nor scolds, and right again sometimes to pet and sometimes to scold. But suppose it is a spiteful stepmother who secretly hates the little one; then, petting or scolding, it is always wrong. In other words, speaking of existence or nonexistence correctly or not depends entirely on having realization. Within the dream, seeing yet another dream. The telling of the dream too is only a dream. “So it is all a dream, nothing at all? . . . When we are awakened by the lion-roar: “All beings are from the very beginning Buddhas,” we can see that illusion and realization are not two, that purity and defilement also are not two. We can see everything as it really is. We can accept the world as no different from Buddhahood. In the sutra it is said: “When sticking attachment arises in Buddhahood, that is the world; when in the world sticking attachment is left off, that is Buddhahood.” The Kegon Sutra explains: “Buddhahood is not opposed to the world, nor the world opposed to Buddhahood.” When sticking attachment is left off, we can see the forms of things as they are, and in the truth of things there is no purity or impurity, as the Prajnaparamita Hridaya Sutra says. When blossoms are on the bough they are pure; when they fall they become litter. Saliva in the mouth is pure, but when it falls it becomes spittle. Hair is clean on the head but gives offence if it falls on food. We speak according to our feeling of things as pure or impure, but in themselves the things are neither pure nor impure. Adults do not like to drink from the same cup in succession. They won’t do it. Children will pass round a cake, biting it one after another, but try to get them to do it when they have grown up! This is because there is a sticking attachment to selfhood. That all beings are from the very beginning Buddhas is the roar of Hakuin himself, but the teaching is the very life of Mahayana Buddhism and appears everywhere. The first step, nay the very basis, of the religious life is to have faith that all living beings are from the beginning Buddhas. Instead of regarding ourselves as descendants of monkeys or as servants of God (though in one sense it may be true), the great thing is to spur ourselves on by deepening our awakening to self, faith in self, respect for self. The Nirvana Sutra teaches: “All, all have the Buddha nature, but it cannot be seen when covered by the passions.” The main thing in realizing Buddhahood and obtaining liberation is to leave our passionate attachments. More properly, it is to penetrate to the source of the mind whence the waves of passionate attachment arise. In the Shodoka poem, Yoka Daishi says that the present illusory nature is in fact the Buddha nature, and this empty body with its phenomenal transformations is in fact the truth-body of the Buddha. We must recognize this as a fact and then realize it in experience. 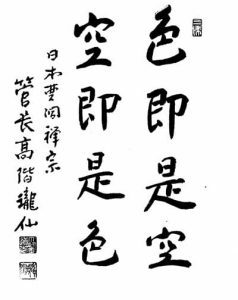 The Third Patriarch in his Shinjimmei classic has the phrase: “The Way is not difficult; it just means distaste for picking and choosing.” Further there is the phrase: “just be without love and hate, and all is clear as running water.” In brief, the essence of the process is this: just once throw away everything. Love and hate, picking and choosing, throw them all away —the no-difficulty-of-the-Way as well—and have done with the clear running water. He who thus renounces all and renounces the attachment to all, can truly possess all. Renunciation and giving up must not be misunderstood as mere negation. Look at our men of possessions these days, the possessors of rank, of fame, yes and even of scholarship. What do they do? The scholar is trapped by scholarship, the man of rank and fame by rank and fame, and the rich man by his wealth. They are afflicted by it; they have to labour for it; and instead of being able to use it they are burdened by it. Because of their sticking attachment they can never throw it away. They are no more than keepers for it. To leave all, to throw away all, is the real way to pick up all and possess all. For such a man, possessions, whatever they may be, are not an obstacle. He can use them, and they become sources of glory and virtue. It is light—the snow on my straw hat! It is not a burden. 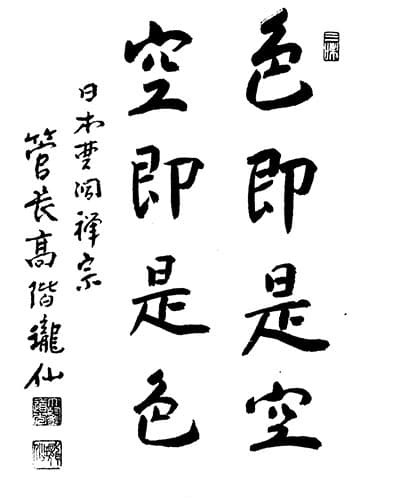 And so with the moon, the flowers, the towering cliffs—this is the world of the great line: “In that not-a-single-thing is endless treasure!” (Plate 6) Mahayana and especially Zen realization puts the label equal on living beings and Buddhas, who by ordinary standards are totally different in every way. underfoot; crossing beyond, we find this coolness of spirit, free from hankerings and attachment—the Buddha always in the self. Do not think like this. From the beginning in the sky Was always the radiant dawn moon. Never have living beings and Buddhas been strangers. Apart from Buddhas, no living beings; outside living beings, no Buddhas. We must realize this most intimate relation, nay identity. We in the end are Buddhas. How tragic to be separated from it! Living beings and Buddhas are no strangers, and furthermore without the one there is not the other. The example is given of ice and water: as apart from water no ice, so outside living beings no Buddhas. We should meditate deeply on these words, bringing our mind to stillness, to taste the real meaning. In fact, better than putting legs onto the snake (which does not need them) with these foolish comments of mine, is to light an incense stick before the Buddha image and reverently meditate on the Song of Meditation. What has been said in this chapter? It is this: that living beings are from the very beginning Buddhas. The wooden Buddha is burnt in the fire, the clay Buddha dissolved in the water, the metal Buddha melted in the furnace. Somehow we have to grasp the true Buddha. Notice the beautifully firm strokes. The raku-hitsu is the top left stroke of the character (Zen).